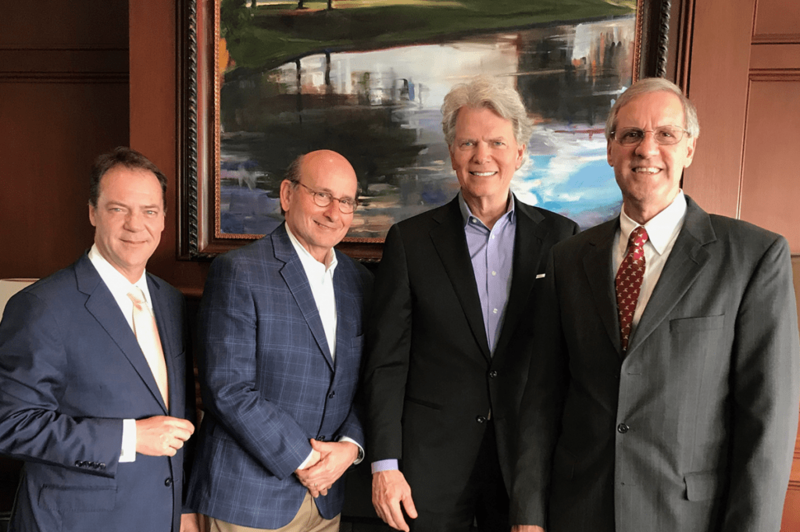 From left, Homewood Mayor Scott McBrayer; Hoover Mayor Frank Brocato; Mountain Brook Mayor Stewart Welch and Vestavia Hills Mayor Ashley Curry have been working together to take a proactive approach to fighting the opioid epidemic. Photo courtesy Dan Roberts. On the same day officers with the Mountain Brook Police Department were trained to use naloxone, one of them used the drug to save a life. Naloxone, also known by the brand name Narcan, is an opioid antagonist – a drug meant to block or reverse the effects of opioids, particularly in the case of overdoses. It can come in the form of a nasal spray or an intramuscular injection and, when used appropriately, it can save a life. That’s exactly what happened within hours of the MBPD’s training session. “I got a call from Chief (Ted) Cook, and he told me this story,” said state Sen. Dan Roberts, R-Mountain Brook, who helped organize the training. Now, Roberts and a handful of other community partners are working to educate the public – not just first responders – on how to properly administer naloxone. The Jefferson County Department of Health is offering training sessions throughout the county for those who may be at risk or know someone who may be at risk of an opioid overdose. Training, which usually takes about 20 minutes, is free. Those who complete a training session with the health department can receive overdose kits containing the drug. Use of naloxone was legalized by the Alabama Legislature in 2015, and since 2016, pharmacies have been able to sell the drug without a prescription. Since then, the number of people the health department has trained has increased “exponentially,” according to Sarah Estopinal, a nurse practitioner who often serves as instructor during the health department’s training sessions. “I think a lot of people didn’t know about it initially. But once they learned about it, they became really intrigued,” she said. Roberts’ campaign to increase awareness for these training sessions dovetails with larger efforts by the mayors of Mountain Brook, Homewood, Vestavia and Hoover, all of whom have taken a proactive approach to fighting the opioid epidemic. Part of those efforts have come in the form of quarterly anti-addiction breakfasts, which feature guest speakers and offer resources to those who are struggling or know someone who is struggling with addiction. The next breakfast will be April 4 at 7:30 a.m. at the Vestavia Hills United Methodist Church and will include a naloxone training session. Over the Mountain efforts have “contributed to the understanding that the problem is not isolated to one specific community in Jefferson County,” Estopinal said. In 2017, 268 overdose deaths were recorded throughout the county, according to the most recent report from the Jefferson County Coroner’s Office. The Jefferson County Department of Health, in partnership with the Recovery Resource Center, hosts regular training sessions at Cooper Green Memorial Hospital on the fourth Wednesday of every month at 5:30 p.m. Individual training sessions can be scheduled by calling 930-1153.